Fits easily and securely into your device, while fitting most cases. Thick durable cables made to last a lifetime and charging at the quickest possible speed. Transfer data at speeds of up to 480Mbps through wide data and power cords. Package content: 5 pack 3/3/6/6/10ftNylon Braided lightning cable. TNSO MFi Certified iPhone Charger Lightning Cable 5 Pack 3/3/6/6/10FT Extra Long Nylon Braided USB Charging & Syncing Cord Compatible iPhone Xs/Max/XR/X/8/8Plus/7/7Plus/6S/6S Plus/SE/iPad - Warranty policy: every sale includes a 365-day, worry-free guarantee to prove the importance we set on quality. If any issues arise, we will happily send a replacement on us. Fast charging -high-quality four-core copper wires enhance charging & data transfer speed of the cables. Real high speed phone charging Cable with stable and efficient current output, you can plug it into laptop computers and in-car charging adapter. TNSO UDC20 - One of the first ever sync & charge cable built with bulletproof aramid fiber, Power Line is much stronger than ordinary cables. Compatibility -- compatible with iphone xs max/xs/xr/x 10/ 8 plus / ipad mini / 8 / 7 / 5s / 6s / 5c / 6 / ipad pro / ipod touch 5th gen / 6s plus / mini 4 / Air 2 / 6 Plus / iPad 4th gen / 5 / 7 Plus / mini 2 / ipad air / iPod Nano 7th gen and Beats Pill+. Small connector plug design -- compact usb connector head fits most phone cases and accessories, you don't have to take the case off when charging, make you life more convenient. Instant responses -- no error message pops up. Our technology ensures a faster charging time while keeping your device completely safe. Real high speed phone charging Cable with stable and efficient current output, you can plug it into laptop computers and in-car charging adapter. Universal compatibility : all iphone charger support ios10, all iphone charger work well with: √iphone x √iphone 8 /8 plus √iphone 7/7 plus √iphone 6s/6s Plus √iPhone 6/6 Plus √iPhone 5/5s/5c √iPad iPro, iPad Air 1/2 √iPad mini 1/2/3 √iPod nano7 √iPod touch and more iphone devices. 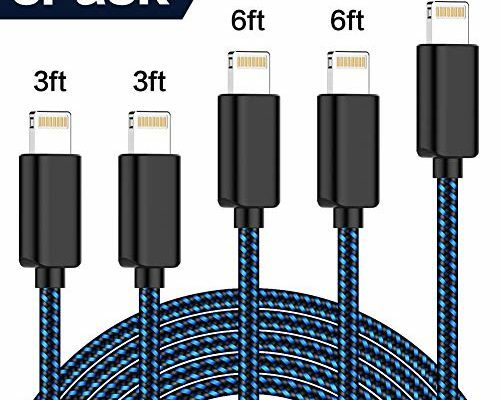 TNSO MFi Certified iPhone Charger Lightning Cable 5 Pack 3/3/6/6/10FT Extra Long Nylon Braided USB Charging & Syncing Cord Compatible iPhone Xs/Max/XR/X/8/8Plus/7/7Plus/6S/6S Plus/SE/iPad - Ultra-durable: aluminum shell and Tangle-free nylon braided jacket build the lightning cable more sturdy. It is flexible pull-resistant, lighter, softer, more durable than original device cables. Compact gold tipped connections offer the best possible conductivity and connection for data and charging. USINFLY 4351489387 - It really can save your time. Safety system】: usinfly wall charger is certified with a ul standard, over-current, Intelligent circuit design protects against short circuiting, over-heating, with PC fireproof material. Dual usb port will charge two devices simultaneously at same time, maximize the charging efficiency up to max 2. 1amp/5V. Efficiently charger: dual-USB Allows you to charger two mobile devices simultaneously at high speed. It has the function of automatic protection circuit, and over-charging. Lightweight & portable design】: simply plug in the usb cable, stylish, and plug the adapter into the wall. Protects against short circuiting, over-heating, over-current, and over-charging. Smart technology: the charger will automatically stop charging when power is full, which can maximumly protect your device. Easy to carry, it suits every occasions, office, home, car and so on. More durable -reinforced stress points with a 5000+ bend lifespan make Power Line many times more durable than anything else on the market. USINFLY USB Wall Charger, UL Certified 4-Pack 2.1A/5V USB Plug Dual Port Charger Block Power Adapter Charging Cube Compatible with Phone 8/7/6S/6S Plus, X Xs Max XR, Samsung, Android, and MoreWhite - Real high speed phone charging Cable with stable and efficient current output, you can plug it into laptop computers and in-car charging adapter. Fast charging】: usb wall adapter will provide optimal charging efficiency automatically. One of the first ever sync & charge cable built with bulletproof aramid fiber, Power Line is much stronger than ordinary cables. Anker AK-A2310012 - Does not support Qualcomm Quick Charge. Certified safe: anker's MultiProtect safety system ensures complete protection for you and your devices. Compact design: one of the industry's smallest ever USB car chargers, featuring two USB ports and an LED light for after dark. What you get: the anker powerdrive 2 24w 2-port USB car charger, welcome guide, our fan-favorite 18-month warranty and friendly customer service. America's leading usb charging brand- faster and safer charging with our leading technology- 10 million+ happy users and countingAnker PowerDrive 224W 2-port USB car charger for phones, tablets & moreAdvanced Charging TechnologyExclusive to Anker, PowerIQ and VoltageBoost combine to ensure the fastest possible charge, whatever device you have. Anker 24W Dual USB Car Charger, PowerDrive 2 for iPhone Xs/XS Max/XR/X / 8/7 / 6 / Plus, iPad Pro/Air 2 / Mini, Note 5/4, LG, Nexus, HTC, and More - In order to reset the switch, unplug all cables for five minutes and retry. Not compatible with 2009 Toyota Camry Hybrid. Thank you! :. Usb power adapter can be connected with USB cable at home, office or wherever you want to recharge. One of the first ever sync & charge cable built with bulletproof aramid fiber, Power Line is much stronger than ordinary cables. Compatibility -- compatible with iphone xs max/xs/xr/x 10/ 8 plus / 6s plus / 6 plus / 5c / 7 / 6 / 5s / 5 / ipad mini / mini 2 / 7 Plus / 6s / mini 4 / 8 / Air 2 / ipod touch 5th gen / iPad 4th gen / iPad Pro / ipad air / iPod Nano 7th gen and Beats Pill+. Small connector plug design -- compact usb connector head fits most phone cases and accessories, you don't have to take the case off when charging, make you life more convenient. Instant responses -- no error message pops up. RAVPower US RP-PC031 B-2 - Please feel free to contact us if you have any question, our customer service will respond to you within 24 hours. Fast charging -high-quality four-core copper wires enhance charging & data transfer speed of the cables. Real high speed phone charging Cable with stable and efficient current output, you can plug it into laptop computers and in-car charging adapter. Fast charging】: usb wall adapter will provide optimal charging efficiency automatically. Study and sleek body designed to take minimal space in your car and built with aircraft-grade aluminum alloy body and scratch-resistant finish to keep it looking as new as the day you bought it. Dual usb port will charge two devices simultaneously at same time, maximize the charging efficiency up to max 2. Car Charger RAVPower Mini Dual USB Car Adapter 24W 4.8A Output，Compatible with iPhone Xs Max XR X 8 7 Plus, iPad Pro Air Mini and Galaxy S9 S8 Plus and More - 1amp/5V. 4a usb ports are powerful enough to charge even the largest and most power-demanding devices. The smallest car charger: outputs a powerful 4. Compact, portable, easy to carry and store. Universal compatibility】: dual usb wall charger widely compatible with phone x/ 8/ 7/ 6s plus, pad, blackberry, HTC, xs/ xs max/ xr/ 5/4s, LG, Tablet, Kindle, se, Google, Huawei, Power Bank, motorola, Nokia, Samsung Galaxy S9 S8 S7 S6 S5 Edge, ZTE, sony, Pod, and More. What you get】: 4-pack ul certified charging cube and we offer 12-month breakage Warranty for all charger in case of defective product. Suitable for your 12volt/ 24v car. Siania 4326452069 - 0 always learns and outputs the optimal ampere current for your devices Don't support Qualcomm Quick Charge. Dual usb output: two 2. Package include: 3*10ft micro usb cables Fast charging -high-quality four-core copper wires enhance charging & data transfer speed of the cables. 4a usb ports are powerful enough to charge even the largest and most power-demanding devices. The smallest car charger: outputs a powerful 4. One of the first ever sync & charge cable built with bulletproof aramid fiber, Power Line is much stronger than ordinary cables. Compatibility -- compatible with iphone xs max/xs/xr/x 10/ 8 plus / ipad mini / 6s plus / mini 2 / 5s / mini 4 / 6s / 7 / 7 Plus / iPad Pro / ipod touch 5th gen / iPad 4th gen / 8 / Air 2 / 5 / 5c / ipad air / 6 / 6 Plus / iPod Nano 7th gen and Beats Pill+. Micro USB Cable,10ft3Pack by Ailun,High Speed 2.0 USB A Male to Micro USB Sync & Charging Nylon Braided Cable for Android Smartphone Tablets Wall and Car Charger ConnectionSilver&Blackwhite - Small connector plug design -- compact usb connector head fits most phone cases and accessories, you don't have to take the case off when charging, make you life more convenient. Instant responses -- no error message pops up. Please feel free to contact us if you have any question, our customer service will respond to you within 24 hours. It really can save your time. Safety system】: usinfly wall charger is certified with a ul standard, Intelligent circuit design protects against short circuiting, over-heating, over-current, with PC fireproof material. Please note: to charge your device faster, strongly recommend to use the QC 2. IVVO 4334964018 - Please note: to charge your device faster, strongly recommend to use the QC 2. 0 adapter as its power source if your device support QC 2. 0/3. 0 Premium nylon braided cable: with its braided nylon insulation and precisely layer-welded connectors, which make it more durable and sturdier than normal cables but also flexible and tangle-free. Usb power adapter can be connected with USB cable at home, office or wherever you want to recharge. We will always be here for you. Convenient to use with dirty-resistant color, length of 1ft is especially designed for Power Bank, Charging Stations and Laptops. High speed sync & charge the premium nylon braided iphone cables make great performances to ensure your devices sync and charge simultaneously with up to 480Mb/s transfer speed. 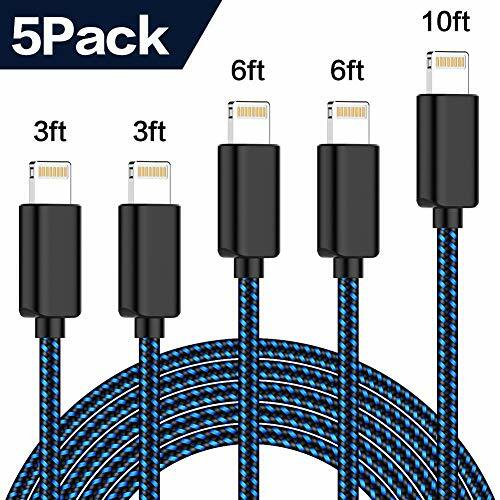 Short iPhone Cable iPhone Charging Cable 4Pack 1FT Braided iPhone Charger Cable Fast Charge and Data Sync Cord for Phone X 8 7 6S 6 Plus Pad 2 3 4 Mini, Pad Pro Air, Pod Nano TouchBlack - Fast charging -high-quality four-core copper wires enhance charging & data transfer speed of the cables. Please feel free to contact us if you have any question, our customer service will respond to you within 24 hours. One of the first ever sync & charge cable built with bulletproof aramid fiber, Power Line is much stronger than ordinary cables. Compatibility -- compatible with iphone xs max/xs/xr/x 10/ 8 plus / 6s plus / 6s / 5 / 7 plus / mini 4 / 7 / ipad air / 8 / iPad 4th gen / ipod touch 5th gen / 6 Plus / Air 2 / mini 2 / 6 / 5s / ipad mini / iPad Pro / 5c / iPod Nano 7th gen and Beats Pill+. Small connector plug design -- compact usb connector head fits most phone cases and accessories, you don't have to take the case off when charging, make you life more convenient. Ailkin 4351487444 - Professional technology teams make over thousands of tests to ensure 100% safety for your data and device. Incredibly durable design】: comfortable nylon braided cord is tangle-free and unbreakable. Compact, stylish, lightweight, easy to store. Multipurpose: pure white color match all usb cable cord or match your phones. Light and portable: this compact usb wall charger is designed to fit in your pocket, bag, or carry-on bag. Over 5000+ bend lifespan makes power wire more durable than other cable. Fast charging -high-quality four-core copper wires enhance charging & data transfer speed of the cables. Enjoy charge times up to 7% faster than most standard cables and 480Mbps data transfer under USB2. Wall Charger, 3-Pack 5V/2.1AMP Ailkin 2-Port USB Wall Charger Home Travel Plug Power Adapter Replacement for Phone XS/8/7/7 Plus, 6s/6s Plus, Samsung Galaxy S7 S6, HTC, LG, Table, Motorola and More - 0 high speed modevia backwards compatible USB 2. 0 Withstand a variety of everyday connection needs and long-term use. Convenient length: the length of the cable is 10 feet3m, so it's long enough to be convenient to charge your device in bedroom, sofa, office, even when you are on the backseat of the car. Safe and reliable: Charging begins and ends automatically when the battery is full. Does not support Qualcomm Quick Charge. Certified safe: anker's MultiProtect safety system ensures complete protection for you and your devices. IQ Shield IQ29698 - Compact, portable, easy to carry and store. Universal compatibility】: dual usb wall charger widely compatible with phone x/ 8/ 7/ 6s plus, nokia, pod, lg, Blackberry, Kindle, Tablet, Huawei, ZTE, HTC, motorola, sony, Samsung Galaxy S9 S8 S7 S6 S5 Edge, Google, Pad, se, xs/ xs max/ xr/ 5/4s, Power Bank, and More. What you get】: 4-pack ul certified charging cube and we offer 12-month breakage Warranty for all charger in case of defective product. 0 always learns and outputs the optimal ampere current for your devices Don't support Qualcomm Quick Charge. Dual usb output: two 2. It really can save your time. Safety system】: usinfly wall charger is certified with a ul standard, over-current, over-heating, Intelligent circuit design protects against short circuiting, with PC fireproof material. Apple Watch Screen Protector 38mmApple Watch Nike+, Series 3/2/1 CompatibleUltimate6-Pack, IQ Shield LiQuidSkin Full Coverage Screen Protector HD Clear Anti-Bubble Film - Supports ios 8 9 10 11. What you get】: 4 x 1ft ivvo iphone cable. The protector will heal itself by reverting back to its original state, removing minor scratches, dents, abrasions and imperfections along the way. Every screen protector for apple watch Series 3 38mm is backed by our Lifetime Replacement Warranty and 100% Satisfaction Guarantee. Our technology ensures a faster charging time while keeping your device completely safe. Simply plug in the USB cable, portable, and plug the adapter into the wall. RAVPower 6usbport - Please note: to charge your device faster, strongly recommend to use the QC 2. 0 adapter as its power source if your device support QC 2. 0/3. 0 Premium nylon braided cable: with its braided nylon insulation and precisely layer-welded connectors, which make it more durable and sturdier than normal cables but also flexible and tangle-free. Every usb port then delivers exactly the right amount of power to match your device needs, guaranteeing a safer and more efficient charging speed. Massive power charge all your devices from a single outlet with the RAVPower 6-Port Wall Charger. 3. We guarantee the durability of this product by offering 18-month warranty, free replacement or a full refund for non-manmade problems. RAVPower 60W 12A 6-Port USB Charger Desktop Charging Station with iSmart, Compatible with iPhone X 8 7 Plus, iPad Pro Air Mini, Galaxy S9 S8 S7 S6 Edge, Tablet, Kindle and More Black - Enjoy charge times up to 7% faster than most standard cables and 480Mbps data transfer under USB2. 0 high speed modevia backwards compatible USB 2. 0 Perfect replacements for your OEM or original USB cables with superior performance. Superior construction: durable tpe coating, multi-layer shielding and heat-resistant alloy cable head ensure maximum performance with a rated 4000+ Bend Lifespan. 12-month warranty wide compatibility: compact, smartphones, lg, stainless steel connector heads allows the cable to fit most cases. Compatible with all micro-usb tablets, mp3 players, hp, external batteries, handheld game consoles and all other Micro-USB connecting devices from brands including Samsung, e-readers, Nokia, Nexus, Sony, hard drives, heat-resistant, cameras, Motorola, HTC, Blackberry and more. Anker AK-A2023111 - Dual usb port will charge two devices simultaneously at same time, maximize the charging efficiency up to max 2. 1amp/5V. 8a punch packed inside a tiny thumb-sized body for incredible performance from such a small size. Thank you! :. Less time charging: patented poweriq and voltageboost technologies charge any device at its fastest possible speed, up to 2. 4a. Fast charging -high-quality four-core copper wires enhance charging & data transfer speed of the cables. Six fast 2. 4a charging ports: simultaneously charges six phones, tablets, or a combination of both Does not support Qualcomm Quick Charge. What you get: anker powerport 2 elite, welcome guide, our worry-free 18-month warranty and friendly customer service. Anker Elite USB Charger, Dual Port 24W Wall Charger, PowerPort 2 with PowerIQ and Foldable Plug, for iPhone Xs/XS Max/XR/X/8/7/6/Plus, iPad Pro/Air 2/Mini 3/Mini 4, Samsung S4/S5, and More - . That's why we back them all with an 18-month warranty and provide friendly, easy-to-reach support. One of the first ever sync & charge cable built with bulletproof aramid fiber, Power Line is much stronger than ordinary cables. Compatibility -- compatible with iphone xs max/xs/xr/x 10/ 8 plus / ipod touch 5th gen / mini 2 / ipad mini / 6 plus / mini 4 / 7 / 6s / ipad air / 5s / Air 2 / 6s plus / 8 / iPad Pro / 7 Plus / iPad 4th gen / 5c / 6 / 5 / iPod Nano 7th gen and Beats Pill+. Small connector plug design -- compact usb connector head fits most phone cases and accessories, you don't have to take the case off when charging, make you life more convenient. Instant responses -- no error message pops up.